Concierge Medicine What is it? Concierge medicine is a growing trend in America, that some see as more convenient than health care. Patients pay a monthly or annual fee to a specific practice, as well as possibly a small fee for each visit. In return, the medical practice keeps their clientele relatively small, which allows for patients to see a doctor quicker than they would at a traditional doctors office. While there are not many doctors who practice concierge medicine, it is growing in popularity, especially for those with a higher income who wish to have a doctor on retainer. With a higher fee being charged, many doctors who practice concierge medicine can keep their schedules free. Some charge up to $5,000 a year, but in return, patients get one on one care, and doctors are able to see them much quicker than they could at a traditional practice. This is especially beneficial to those who visit the doctor often, yet are annoyed with excessive time spent in waiting rooms, often associated with practices who accept traditional health insurance. 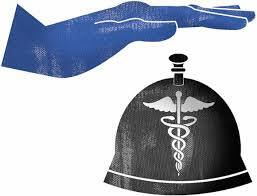 While certain concierge doctors do charge an amount that only upper class citizens can afford without breaking the bank, there are affordable options. For example, doctors within the MDVIP Wellness Plan charge between $1500 and $1800 annually, and a client can see any doctor in the country affiliated with the plan. There is widespread criticism of the system of concierge medicine. Critics of the system and network of doctors say it favors the rich. They say too many people could start using these doctors, which can hurt the middle and lower classes. While there is only an estimated several thousand concierge doctors practicing in America, they can drastically drive up insurance costs for everyone else. If less people of the upper class are spending money on insurance, then it brings up the cost for everyone else. While it does reduce traffic in traditional doctors offices, there are still many people critical of the idea. Concierge medicine has existed in other countries for a long time. It is a relatively new concept in America- the first experimental concierge practice was opened stateside in 1996. With a growing amount of doctors accepting annual fees in exchange for being on retainer, concierge medicine seems to be paving its way in America, and will likely continue to grow in the coming years.